Situated in Etoges, this spa hotel is within a 5-minute walk of Church of Etoges and Champagne Ruffin et Fils. Chateau de Montmort and Champagne Perrot-Batteux et Filles Winery are also within 9 mi (15 km). Located in the heart of Romilly-sur-Seine, this hotel is within 1 mi (2 km) of Romilly War Memorial and Church of St. Martin. Bechere Park is 1.3 mi (2 km) away. Romilly sur Seine Station is 20 minutes by foot. Located in the heart of Nogent-sur-Seine, this hotel is steps from Saint-Laurent Church and Camille Claudel Museum. Château de la Motte-Tilly and Romilly War Memorial are also within 12 mi (20 km). Nogent-sur-Seine Station is 11 minutes by foot. Situated in Vertus, this bed & breakfast is within 3 mi (5 km) of Champagne Vallois Ferat Winery, Champagne Champion Denis Winery, and Champagne Perrot-Batteux et Filles Winery. Champagne Ruffin et Fils and Church of Etoges are also within 9 mi (15 km). How Much is a Hotel Room in Sezanne? Hotels in Sezanne start at $45 per night. Prices and availability subject to change. Additional terms may apply. 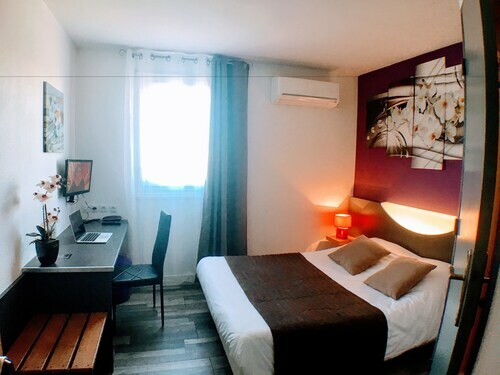 Booking a trip to Reims - Marne and looking for comfortable accommodations in Sezanne? There are a range of options waiting to be booked through Travelocity's destination page. With 2 hotels, apartments and other accommodation options on Travelocity within a 6-mile (10-kilometer) sweep of the CBD district and surrounds of Sezanne, it shouldn't be hard finding something appropriate. The Hôtel le Relais Champenois et du Lion d'Or is an excellent Travelocity-listed hotel selection due to the fact that it's located such a convenient distance from the middle of Sezanne. 12 miles (20 kilometers) away from the center of Sezanne, you can find the Le Château d Etoges. Alternatively, the Auberge de Nicey is located 14 miles (23 kilometers) away. The Hostellerie Domaine de Montgivroux and also the Hôtel le Relais Champenois et du Lion d'Or are two alternative places to base yourself in Sezanne. 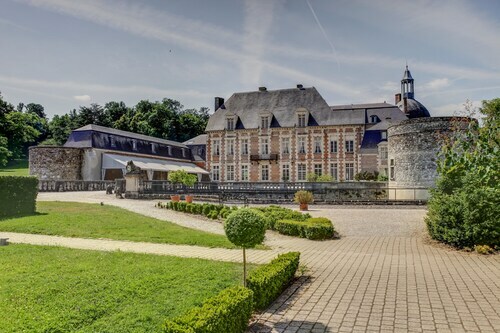 Should you have the time, you might like to see more of the Champagne-Ardenne region. Champagne-Ardenne proudly boasts rural landscapes. Interesting visitor places of interest are castles and traditional villages. In this fascinating part of France travelers might also partake in hiking and cycling. Looking for activities? You could spend the day exploring Perrier Jouet and Mercier, which can be found in Epernay, 25 miles (38 kilometers) northeast of Sezanne. The Hostellerie La Briqueterie and La Villa Eugène are just some of the comfortable apartment and hotel choices in Epernay. Alternatively, you could consider staying at Bergeres-les-Vertus, 17 miles (27 kilometers) northeast of Sezanne, where you have the options of the Hostellerie du Mont-Aimé and Hostellerie de la Reine Blanche. 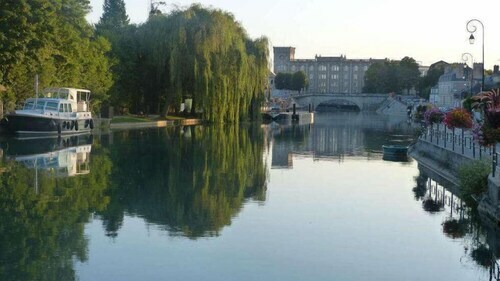 The Champagne Perrot-Batteux et Filles Winery and Champagne Champion Denis Winery are other frequented sites to get to know should you visit Bergeres-les-Vertus. Get yourself a serving of sport by making the journey to Bercy Arena, which can be found 60 miles (99 kilometers) to the west of Sezanne. And travelers that would like to find a bed near the stadium can explore the Grand Hotel du Palais Royal or the Hôtel Esprit Saint Germain. Roissy-Charles de Gaulle Airport is a primary entry point for those flying to Sezanne. You can find it 55 miles (90 kilometers) from the center of the city. For wise travelers who hope to find a Travelocity-listed base nearby, read about Sheraton Paris Airport Hotel & Conference Centre or Hilton Paris Charles de Gaulle Airport.